The Carriage House’s “ClubHouse Model” program assists those with mental illness to recover and gain self-worth by providing a supportive work environment that helps members with work-oriented skillsets and personal growth. In addition to work training, Carriage House assists with further employment opportunities, education, housing, benefits, and other needs. The Clubhouse in Fort Wayne, Indiana goes by the name The Carriage House. Founded in 1997, the Carriage House is a place of refuge and rebuilding for adults with serious mental illness. Side by side, staff and members of the Clubhouse (those adults with a history of mental illness) work together in the kitchen making lunch, answering phones, entering data, and helping with anything that needs to be done, including the variety of support programs at the Carriage House that include assistance with housing, education, and further employment opportunities. This is called a Work-Ordered Day, and it takes place from 9-5 pm, at least five days a week. The Clubhouse intentionally includes members in everything, from staff meetings to staff evaluations to organizational tasks and needs. The purpose of this “peer and partner community” is a “radical” departure from traditional methods, helping members grows personally in self-esteem, hope, and belief in themselves and each other. 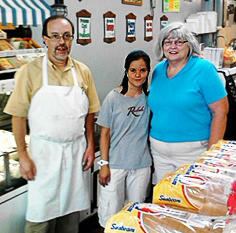 They believe that each member has personal talents and abilities, and the Carriage House utilizes and affirms them. For Andy Wilson, Executive Director, creating an environment that facilitates—and not fixates—on growth is the key. There are two important elements to this kind of environment: meaningful work and relationships, and these go hand-in-hand. “Relationships are a function of shared experience over time.” As members and staff wash dishes, do jobs around the Clubhouse that are helpful and meaningful, friendships grow organically. “In that space, people just get better. People, in the right environment, get better,” Andy explained. But the Clubhouse isn’t the destination; it’s a rest-stop on the road to independent living. Staff and fellow members help move individuals to new residences, assist in finding jobs or an educational track, and act as support and accountability for staying out of the hospital or jail. 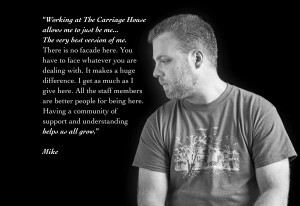 Since 1997, The Carriage House has worked with more than 1500 members, assisted in over 400 members returning to the workforce, helped over 200 members with educational goals, made more than 20,000 phone calls to isolated members in the community, and moved more than 300 members to new homes. These numbers are what “success” looks like at the Carriage House. To say that Fort Wayne’s Clubhouse is a replicable model is an understatement: in fact, as part of Clubhouse International, it is one of over 300 Clubhouses worldwide, and it certainly wasn’t the first Clubhouse (which started in New York City in 1948). At the center of Clubhouse International’s organizational practice is its unique approach to staffing/member relationships. This approach includes: all space and meetings are open to both members and staff, few enough staff members at each Clubhouse such that member involvement is necessary, general roles for staff such that specific work responsibilities do not interfere with relationships with members, intentional involvement in all areas of Clubhouse. Another strength of Clubhouse International that affects its replicability is its up-to-date International Standard for Clubhouse Programs, which defines clearly the Clubhouse Model. The Clubhouse Accreditation Process assesses each Clubhouse by the terms laid out in the Standards. Not all Clubhouses look the same, however, every Clubhouse has its own personality and successes.